I wish Hazel Walker’s Arkansas Travelers had come to my corner of New England to play when I was a kid. Some say that Walker, who grew up in Oak Hill, Arkansas, was the best female basketball player there ever was. She was as accurate shooting free throws from a sitting position, or while kneeling, as she was standing up. She played for AAU teams for 14 years in the 1930s and early 1940s, and the barnstorming All American Red Heads in the mid-1940s. She started her own team, the Arkansas Travelers, in 1949, a group of women who barnstormed around the country until 1965, playing 200 games a year — and winning about 85% of them. Hazel began playing basketball in the late 1920s at the age of 14. As a senior in high school, she led her team to Arkansas’s first state championship for girls, which was sponsored by the AAU, not the state high school association. Walker’s team lost the championship game by a point, but Hazel was named to the All-Star team. A tall, striking young woman of part-Cherokee descent, Hazel also was voted most beautiful girl in the tournament. 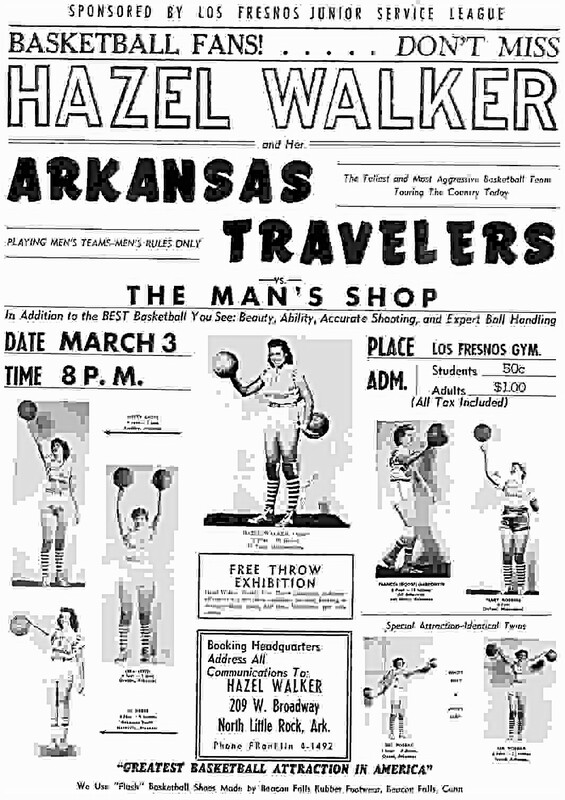 In 1949, Hazel decided to start her own team, Hazel Walker’s Arkansas Travelers, who played a more serious brand of basketball while still entertaining the fans. Hazel held tryouts and chose the seven players who she felt exhibited the best combination of good character, neatness, attractiveness, and ability. With money she’d saved from her three-year stint with the Red Heads, Hazel bought a station wagon with a luggage rack on top and started scheduling games. Wherever they went, the Arkansas Travelers challenged the best male athletes in town to games and played by men’s rules. They played six nights a week and often drove to the next stop after they’d split the gate receipts with the home team. To ward off robbery attempts, the travelers carried a gun with them, “and we weren’t afraid to use it,” said Garroute. 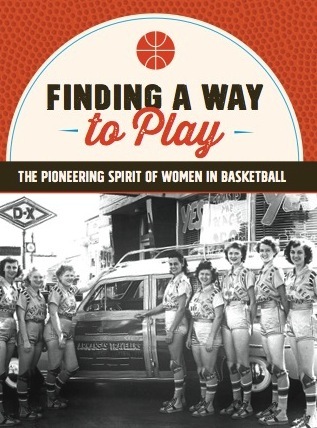 The Travelers showed a generation of little girls in the 1950s and early 1960s that women could lead independent lives and be as good at basketball as any man. In 16 seasons of play, the Travelers won 85% of their games. Hazel was said to have won every halftime free-throw shooting contest during those 16 years. “To see her play, to see that women could be that good, it changed me forever,” said Elva Bishop, a documentary filmmaker for North Carolina public television. She saw Walker play in her hometown of Aberdeen North Carolina and went on to make a documentary film about the pioneers of the women’s game. Walker retired at the age of 51 in 1965. The Arkansas Travelers retired with her. Walker was the antithesis of Babe Didrikson in terms of the image she conveyed of what a female athlete should act and look like. But she also was a smart business woman, certainly, the first to own and operate her own team. She was inducted into the Arkansas Sports Hall of Fame in 1959 and into the National Women’s Basketball Hall of Fame in 2001. I sure wish I’d had the chance to see her play. If you, or anyone you know had the chance to see Walker play, leave a comment here or email me at jolannin@maine.rr.com. This is my great aunt!! I have a lot of great memories with her. She was awesome at basketball but an awesome person. This is a great article. ….the best thing I remember abt her is that is was very classy!!! She had style like no other!! Look like a woman, act like a woman and play ball like a man!! My mother, Peggy Tortorice (nee Dean), was a member of the Arkansas Travelers. She joined them out of high school after having been an all-State player in Arkansas for three years. In fact, she’s the second from the left in the cover photo of your book, “Finding a Way to Play”. Today is her 85th birthday. She would be thrilled if I could her get a copy of the Hazel Walker ad at the start of your post.